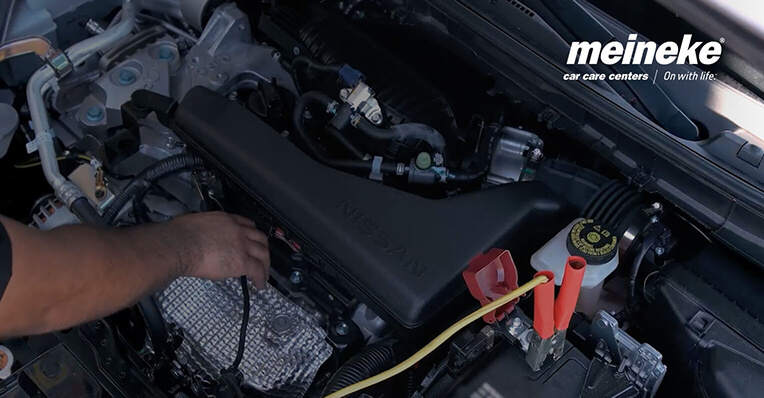 What if Your Car Battery Won’t Hold a Charge, or Keeps Dying? 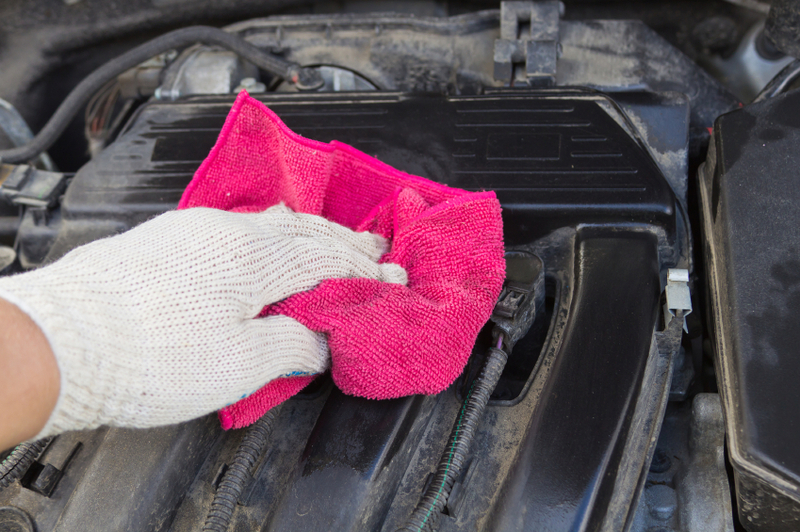 Why Won’t Your Engine Jumpstart? Step 1: Park the vehicles next to each other. Park the functioning car so that the vehicles face each other, preferably only about 18 inches apart, but never touching each other. 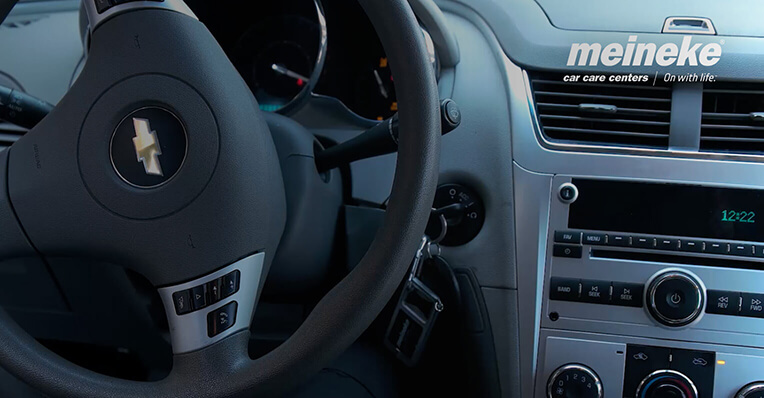 For automatic transmission cars, put the vehicle in park; for a manual transmission, set the vehicle to neutral. Set the parking brakes on both, so neither car moves unexpectedly. Both cars should be turned off, with keys removed. Set down the jumper cables on the ground, making sure the clamps do not touch each other. terminals are dirty, wipe them off with a rag or wire brush. Step 3: Attach one red clamp to the positive terminal on the dead battery. Step 4: Attach the other red clamp to the positive terminal on the working battery. Step 5: Attach the partnered black clamp to the negative terminal on the working battery. Connect the black, negative cable clamp to the working battery’s negative (-) battery terminal. Step 6: Attach the partnered black clamp to a clean nut or bolt on the engine block. Walk over to the car with the dead battery. Do not connect the black, negative cable clamp to the dead battery. 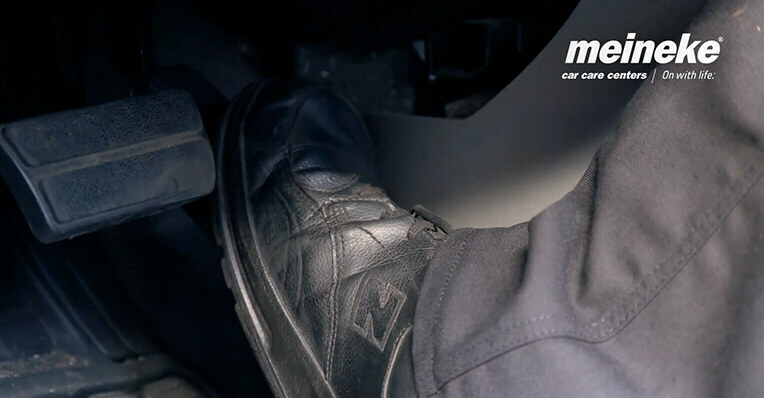 Instead, attach that clamp to an unpainted, metal part of the car such as a shiny, clean nut on the engine block. This will help ensure a safe jump. Step 7: Start the working vehicle and let it run for a few seconds. Start the working vehicle. Wait a minute or so. 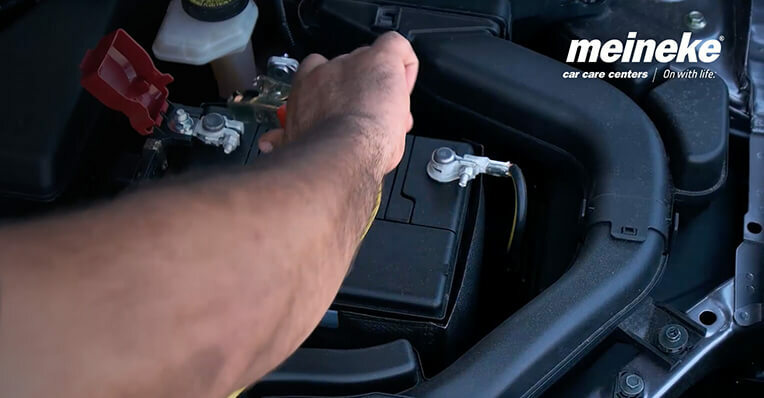 Depending on the age of the battery and how long since it died, you may need to let the car run for a minute or two to get the jump to work. Step 8: Start the dead vehicle. It should turn on. Try starting the dead car. 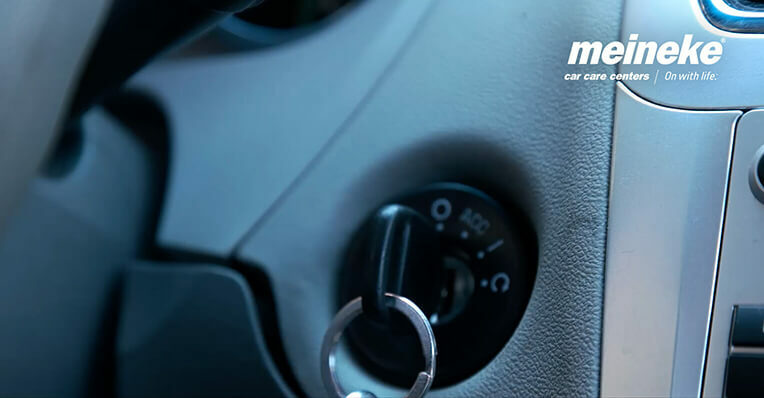 If the car doesn't start, allow the working vehicle to charge the battery for an additional minute or two before attempting again. 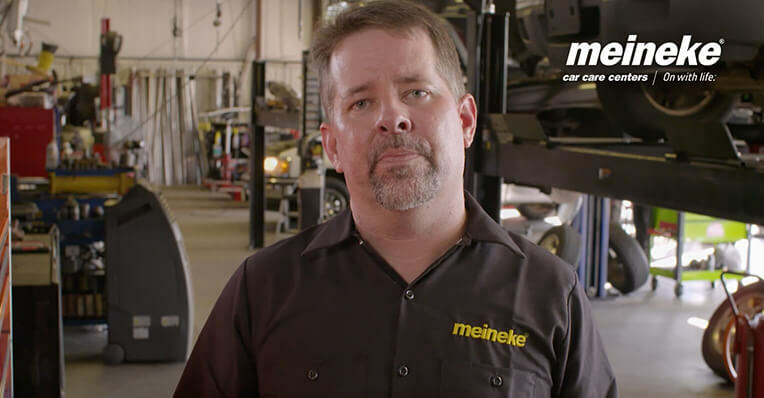 Step 9: If it doesn’t turn on, try revving the engine of the working vehicle. 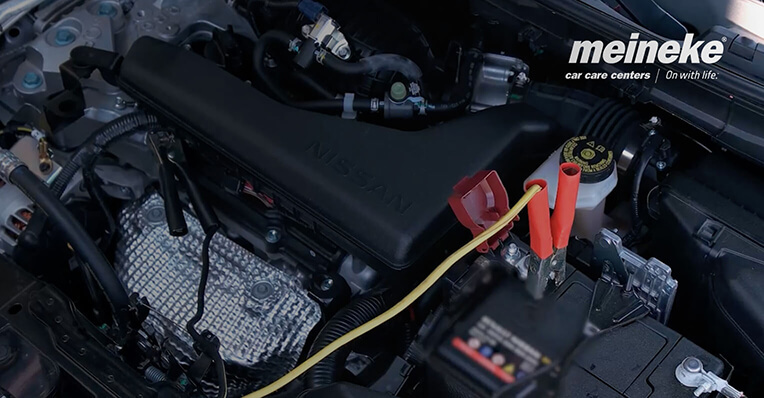 In some instances, slightly revving the engine of the working car while charging the dead battery may help. Step 10: Disconnect the black jumper cables first, then disconnect the red ones. 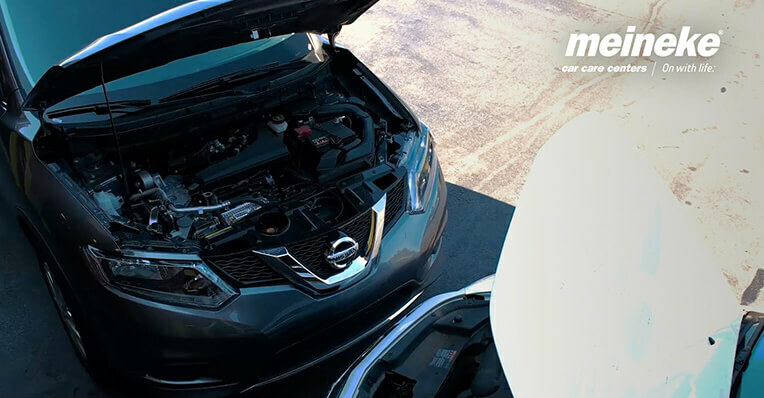 Step 11: Take a short drive to help recharge the battery. 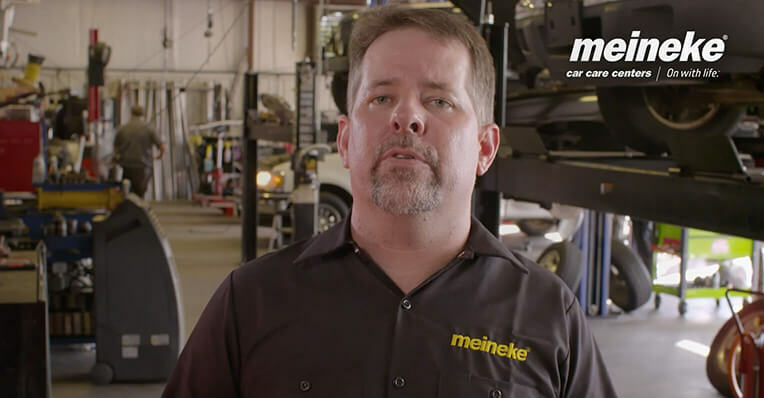 talk to your local mechanic at your neighborhood Meineke Car Care Center. First and foremost, turn off your engine. While cleaning the terminals is a fairly straightforward DIY project, there is still a slight risk of injury. You can avert this risk simply by making sure you have the engine turned off while you work. Next, loosen the nut holding your negative cable in place; you’ll likely need a wrench for this. Detach the cable from the post. Then, follow the same steps with the positive cable. 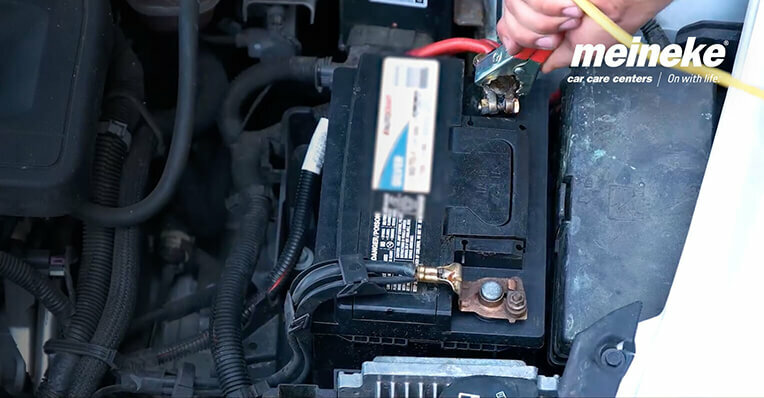 Take just a moment to visually inspect your car battery. Specifically look for any fissures or cracks. 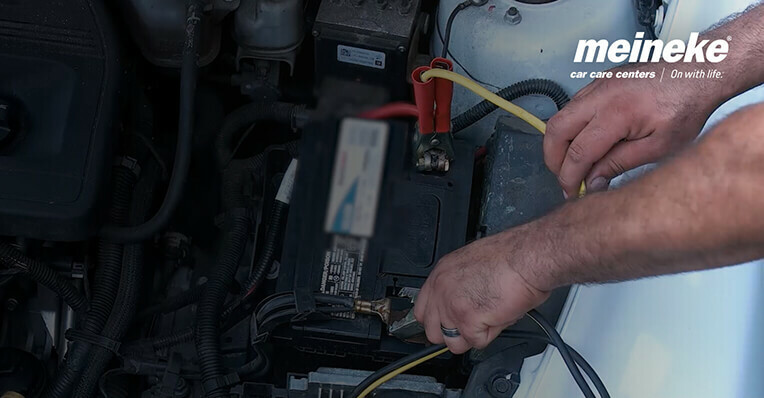 If you see any, that means there’s a problem with your car battery that you probably won’t be able to fix on your own; more likely than not, you’re looking at the need for a battery replacement. You’ll also want to look at the cables and clamps themselves. Again, what you’re looking for is very obvious evidence of wear and tear. If your cables or clamps have big rips or tears, you’ll probably need to have them replaced. These things really can’t be mended. Assuming you don’t see any of these obvious signs of wear and tear, you’ll want to mix your cleaning solution—one tablespoon of baking soda into one cup of water. Mix ‘em up thoroughly, then dip an old toothbrush into the mixture. 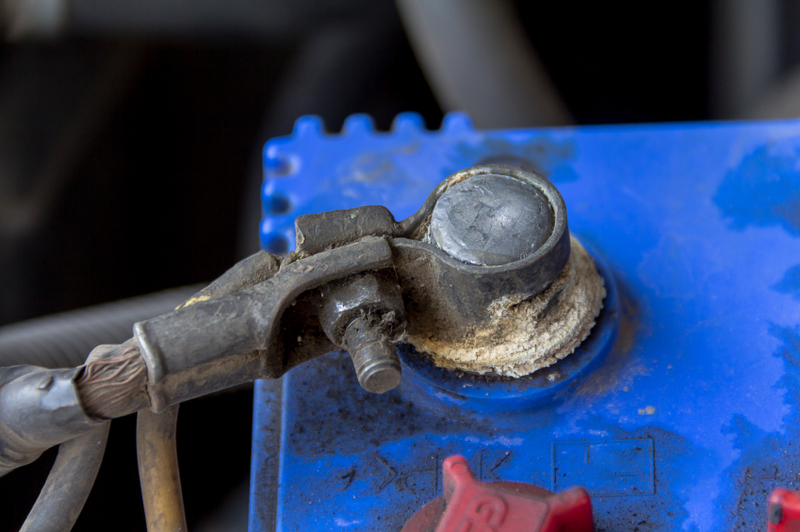 Use the toothbrush to scrub away any signs of corrosion you see on your battery terminals. 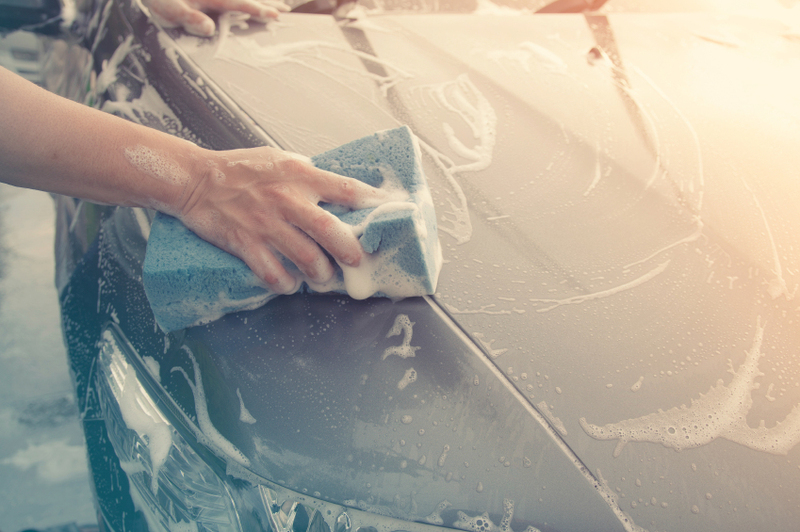 Don’t be afraid to really scour thoroughly to get things squeaky clean. You may have to soak your toothbrush in the baking soda mixture a couple of times as you keep scrubbing away. When you finish, use a spray bottle with cool water to rinse off any residue. It is imperative to make sure all baking soda and corrosion is washed away. Then, use an old rag or towel to pat the battery and clamps completely dry. 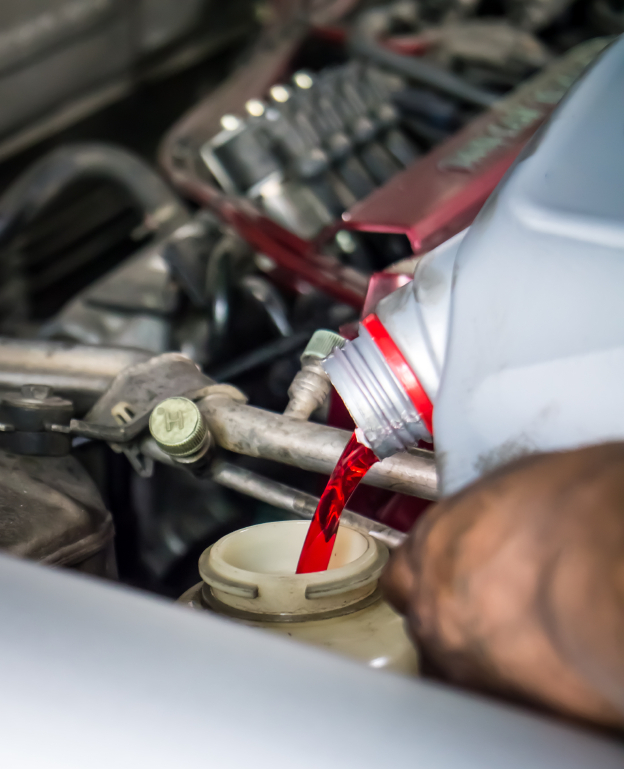 Use a little bit of petroleum jelly to lubricate the terminals. Reattach the cables to their correct terminals. This could be a part of bigger problem.